SPW027202 SCOTLAND (1929). Glasgow, general view, showing George Square, Queen Street Station and Argyle Street. An oblique aerial photograph taken facing north. 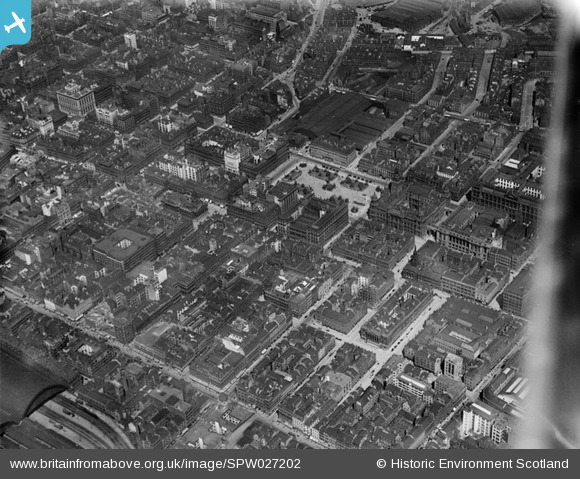 Title [SPW027202] Glasgow, general view, showing George Square, Queen Street Station and Argyle Street. An oblique aerial photograph taken facing north. 57 Candleriggs. Site of famous Glasgow pub Granny Black's. Traded as a pub since 1820, in 2001 after the partial collapse of the building next to it, it had to be demolished.